Topics: Business Development, Accredited Quality Contractor, Diversity Programs, Peer Groups, Awards, and Excellence In Construction. 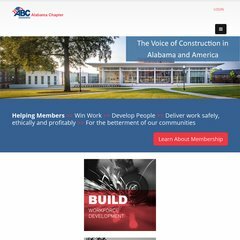 abc-alabama.org Does your business insurance build dividends? Ours does. There are 4 DNS records, such as dns173.b.register.com, dns247.c.register.com, and dns249.d.register.com. It is hosted by Netriplex Llc (North Carolina, Asheville,) using Microsoft-IIS/7 web server. ASP.NET is its coding language environment.